Supporters of Egyptian President Mohamed Morsi and members of the Muslim Brotherhood chant slogans during a rally on Dec. 14, 2012, in Cairo, Egypt. 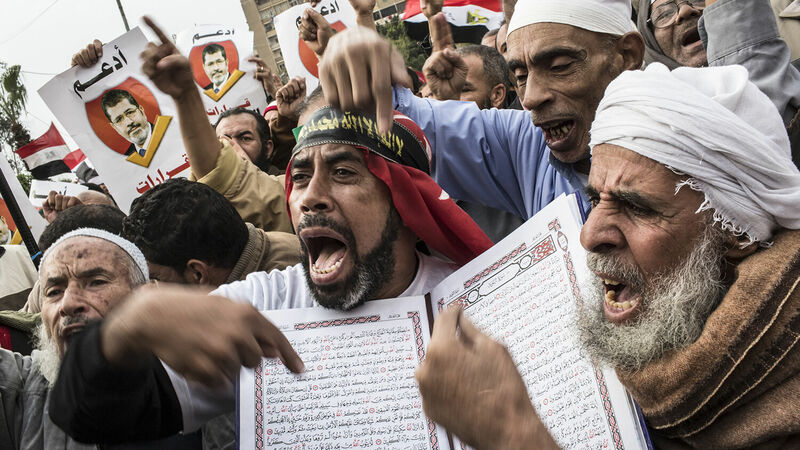 For nearly 20 years before the Egyptian Arab Spring ousted President Hosni Mubarak and empowered the Muslim Brotherhood’s radical Mohamed Morsi, the Trumpet has watched events in Egypt through the lens of Bible prophecy and consistently proclaimed that Egypt would dramatically radicalize. President Sisi is obviously imperfect in many ways, but he is quite remarkable in others. “Be not overcome of evil,” the Bible concurs with Sisi, “but overcome evil with good.” Unfortunately, Sisi, like every one of us, is unable to utterly and permanently overcome evil with good, apart from God. It’s impossible for him alone to completely suppress radical Islam in Egypt under a tight lid. And in so many ways, the radical measures Sisi has taken against Egyptian Islamists show the enormity of what he’s up against. It’s much bigger than the strong, moderate Egyptian leader. If you would like to understand these prophecies in greater detail, read “Why the Trumpet Watches Iran Allying With Egypt” and request The King of the South.